When it comes to stunningly beautiful kitchen makeover ideas, you don't have to hire a designer to get a fabulous look just because the kitchen is the workhorse room of the house. Even though aesthetics are important, it's also important to get flooring that is slip-resistant and wears well over time. 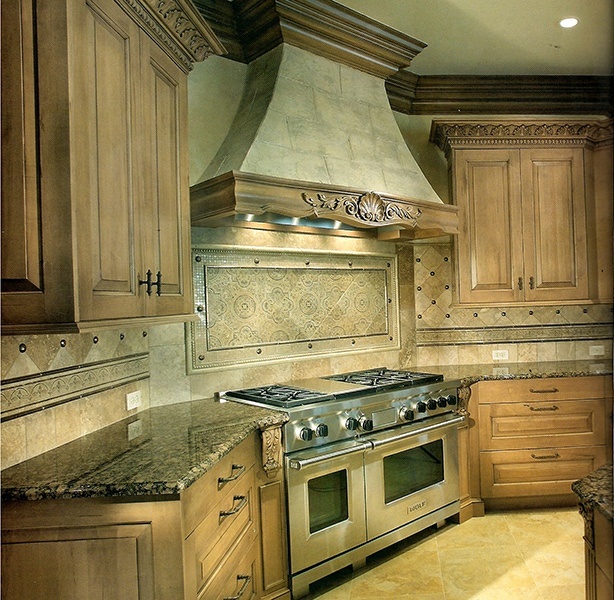 Natural stone is a perfect choice and can enhance any kitchen with luxurious looks. 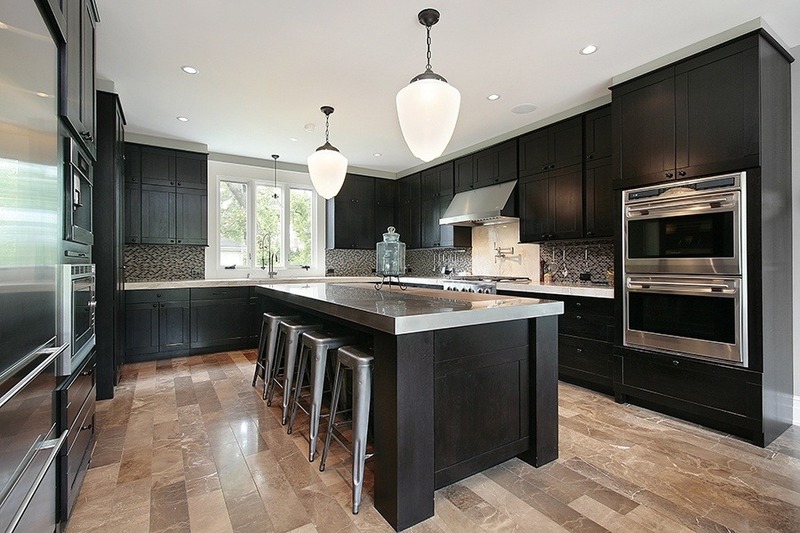 Once you understand some simple design guidelines, you'll be well on your way to creating the kitchen of your dreams. 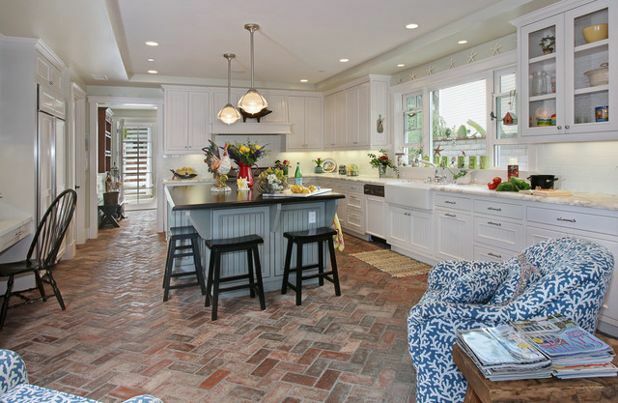 Here are a few kitchen floor tile ideas to create eye-catching floor designs simply by following some well-worn design "recipes" for a successful kitchen makeover. 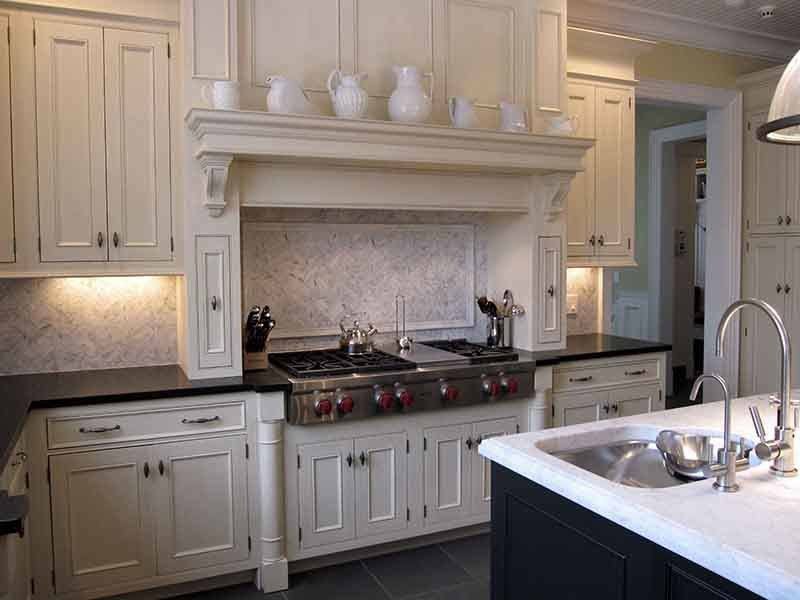 Traditional design advice is to keep to 3 colors or less in the kitchen. The main areas of color will be the cabinets, the countertop (including the backsplash), and the flooring. Thus, there are several ways to use different colored tiles to get a seamless look to the kitchen. One way is to match the flooring with the cabinet colors, leaving the countertop to be the sole contrasting color, like in this design using a travetine floor. By doing this, you can create an expansive and clean feel to the space, particularly if your cabinets and flooring are either neutral or light colored. While it is important that your kitchen floors have some grip to them, it doesn't mean you can't give them a good polish. 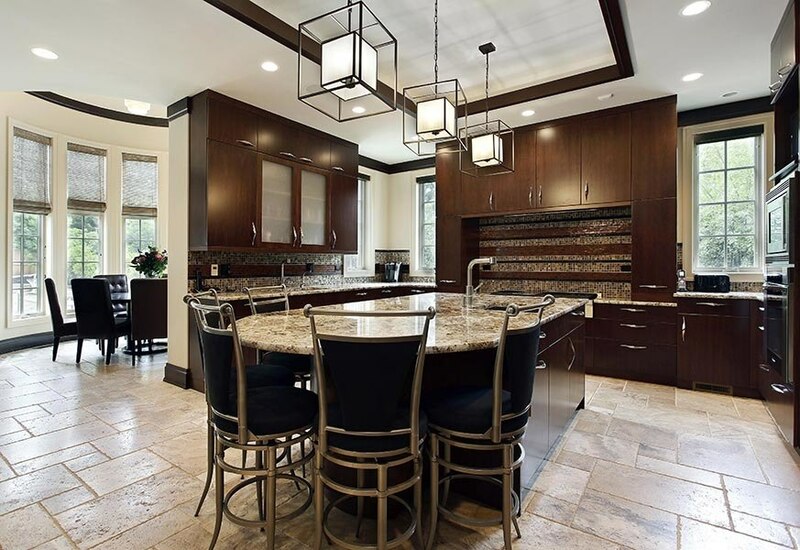 If you want a kitchen that bounces a lot of light around, then you might pick a backsplash of glass strip mosaics paired with a highly polished marble or granite countertop. 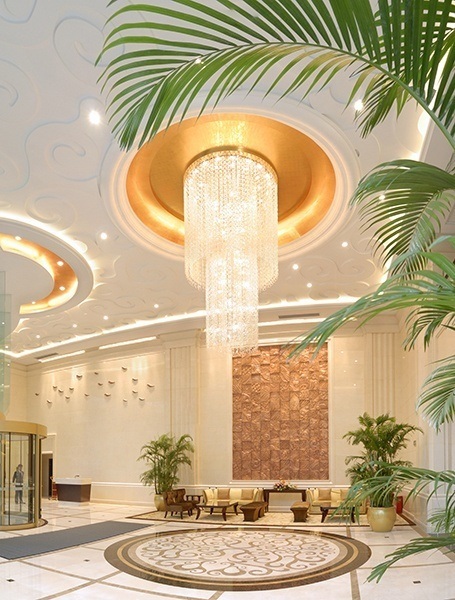 The effect is sparkling and can even be mimicked with stone flooring of a similar hue. That leaves the cabinets to provide a contrasting tone that grounds the entire design and makes it somewhat surreal and highly modern. Instead of trying to match your floors with neutral or light colors, you can pick designs that offer a high visual contrast. Black and white designs are traditional high contrast designs that are particularly beautiful. You can use them to create checkerboard kitchen floors. However, you can also use strong colors like red and white to create the same designs and ramp them up a notch. Here is a kitchen design that uses a simple black stone in a large square tiles that contrast beautifully with the pristine, white, cabinets. If you think stone rugs or borders are just for bathroom floors, you're missing out on some of the most eye-catching designs available for your kitchen. You can use already wonderful "pre-made" designs in mosaic or waterjet patterns, like in the Curv collection, to create a stunning look. This waterjet medallion rug would be equally stunning in an open kitchen floor plan. If you want something less elegant and more artsy, there are plenty of stone mosaic patterns that can be used on both the backsplash and as a matching rug in the kitchen. Make room in your design palette for more creative layouts than the traditional grid designs. You can choose any stone tile and put it at an angle in herringbone patterns. Or, choose a brickwork layout that isn't perfectly grid-like to add some interest. There are tiles that offer basketweave patterns and more. Here is one such interesting design layout that uses a warmer, contrasting, color on the floor than everywhere else in the kitchen laid out in an interesting pattern. The kitchen floor that is textured is less likely to be slippery when wet. So, texture is a good thing on the kitchen floor. You don't want it too highly textured, however, because it will also pick up dirt more. Stones with a matte finish can be the perfect compromise. However, you don't have the same restriction on stone tilework in the kitchen when it comes to walls, so if you want engraved tiles or dimensional tiles, go for it. Here is an example of a design with etched tiles on the backsplash and a matte textured stone tile on the floor. Wood flooring has always been an exquisite feature of the perfect home, but wood floors in the kitchen can end up damaged quickly. If you like the look of wood, but want something more durable in the kitchen, choose stone look-a-likes and lay them out in planks or strips to get that wood floor look. You don't have to be a designer to understand the simple kitchen floor tile ideas I've illustrated here. With these guidelines in place, you can feel confident in getting the look you want without sacrificing any of the kitchen utility that you desire. Whether it is using simple matching of colors and finishes or more complex ideas, like interesting layouts and wood look-a-like floors, you can create a stunning design on your own. 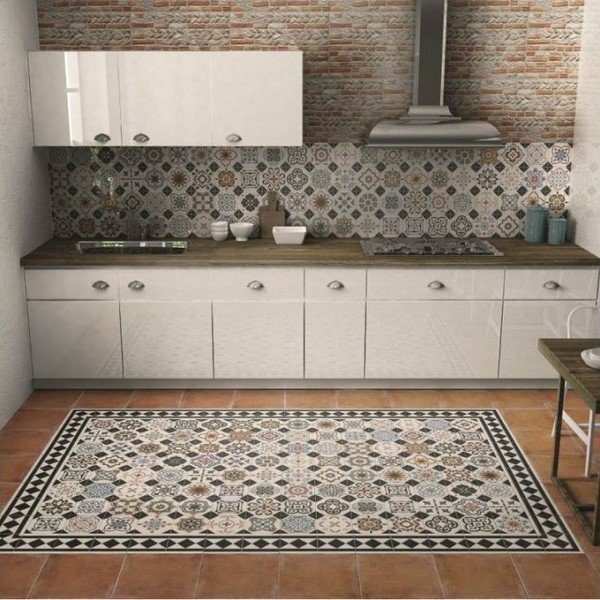 Don't forget to make use of more creative techniques by leveraging gorgeous designs already available with mosaics and waterjet tiles, too. Add some contrast and textural relief if the design is too bland for your tastes. By using these design ideas, this may end up being the best kitchen design you've ever imagined. 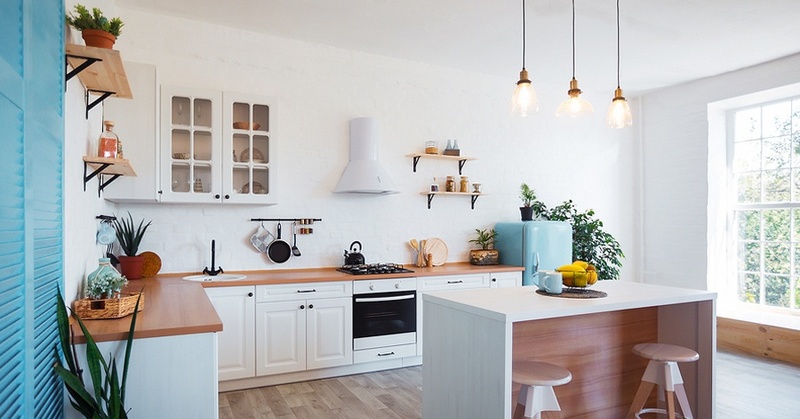 Hopefully, the next time you get a impulse to do a kitchen makeover, you will be able to pull out these tips and hit the road running with a spectacular new look almost instantly. From this list, have you gotten some ideas of your own about your next kitchen makeover?